This is an example of a common exception that can be thrown when verifying a signature after decryption an object. To avoid this, it is often enough to configure your Decryptor using the following setting before decrypting. Thanks this helped me fix my problem decrypting. I'm now getting the same error while trying to validate a signature only. Any idea how to solve that? Using OpenSAML 3.3.0 api from Shibboleth I am getting the same error: org.opensaml.xmlsec.signature.support.SignatureException: Apache xmlsec IdResolver could not resolve the Element for id. Sorry, I dont have any specific advice for this? The IdP is using SHA1 algorithm here. The same code works fine with SHA2 (SHA256). Is this someway related with SHA1 ? Could you post some workable code showing the problem on gist and I will investigate it. I am getting the exception on profile validator. If I ignore that then I am getting another exception on validation. Hi, I have the same Problem. 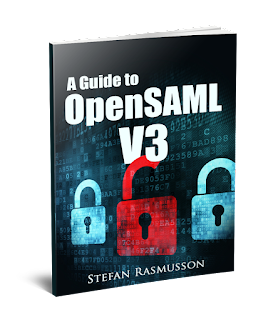 This is basically the example from the Book (A Guide to OpenSAML V3) on page 54. When I call profileValidator.validate(assertion.getSignature()) it throws the aforementioned signature exception. Do you get it when running the example in the book? @Stefan Rasmusson: The example on the book works fine. Is there something specific needed before you can validate the assertion signature? Hm, the Exception says "Apache xmlsec IdResolver could not resolve the Element for id reference: <...>", and this is exactly the ID of the Assertion. So for some reason, during signature validation, the library cannot find the Assertion in the document and I cannot use the decrypter.setRoot[..] because I'm not trying to decrypt assertion. HA! I've got it. For some reason, you need to explicitly specify the ID attribute of the assertion before signature validation.